All recipes from Honey & Co.: The Cookbook by Itamar Srulovich and Sarit Packer. (Little, Brown). Photos by Patricia Niven. Place the whole cauliflower, leaves and all, in an ovenproof saucepan that fits it snugly. Fill the bottom of the pan with enough water to just cover the stem and leaves. Drizzle the oil all over the florets and sprinkle with the spice mix and sea salt—it will look like a lot, but you want a layer of spice as a crust. Place in the oven and roast for 1 to 1 1/2 hours. You will know it is cooked when you can insert a small knife through the center of the cauliflower all the way down into the stem and it goes in easily. the onions are caramelized and brown. Remove from the heat. Halve the lemon. Mix the tahini paste in a small bowl with the juice from one half of the lemon and the salt. Add just less than half a cup of water and mix well. Continue mixing and adding water very slowly until the paste loosens to a creamy texture. Carefully lift the cooked cauliflower out of the water and cut it into thick slices, including the stem and the leaves, which will taste great after the slow-cooking. 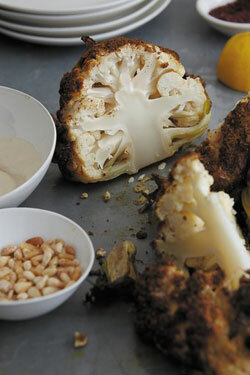 Divide the cauliflower between two plates. Squeeze the juice from the remaining half of the lemon all over, then top with the caramelized onions and tahini paste. Garnish with the pine nuts and the sumac (if using) and serve with the crispy flat bread. This is a base preparation from which you can derive dozens of different versions. It really is a cheesecake, and flourless as well (though you can sprinkle it with some crunchy breadcrumbs if you want), but unlike sweet cheesecake, it is only truly delicious when eaten warm and oven-fresh—it does not cool down well. Mix all the cheesecake ingredients together in a food processor to combine thoroughly and then transfer to a lightly buttered baking dish (an 8-inch diameter casserole dish is best). Use any one of the following vegetable preparations, or try your own combination (any vegetable you like can work, but if you want to use something with high water content such as spinach or tomatoes, it is best to cook or roast it first). 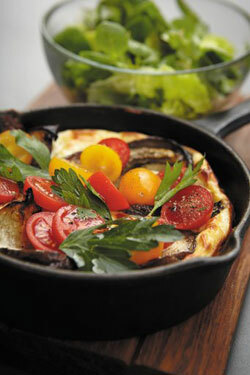 Just half-submerge the vegetables in the cheesecake mix and put the dish in the oven to bake. Set a timer for 15 minutes, then turn the dish around (so that it cooks evenly) and allow another 10 minutes, by which time the cheesecake should just be going golden. Bring it to table in the dish it was cooked in, along with a big spoon to dish it up. Use 2 eggplants. Cut each one into 8 wedges and place in a roasting tray. Brush with olive oil (about 3 tablespoons), season with sea salt and a hint of pepper, and roast in a hot oven (425°F) for 20 minutes or until golden. Use 3-4 zucchini. Cut into disks (about as thick as a finger) and place on a roasting tray. Brush with a little olive oil (about 2 tablespoons) and season with sea salt and pepper. Roast at 425°F for 20 minutes. Mix with about 15 whole mint leaves while the zucchini slices are cooling. Use 3 red or yellow peppers. One a foil-lined baking sheet, roast peppers on high broil for 4-5 minutes to burn their skin, then flip and scorch the other side for another 4-5 minutes. Transfer burnt peppers to bowl and cover with plastic wrap. Once the peppers are cool enough to handle, peel the skin, then mix with the picked leaves from 3-4 sprigs of fresh oregano (or basil, if you prefer) and a handful of pitted olives. Mix all the marinade ingredients together with the chicken pieces to coat thoroughly, then cover and set in the fridge to marinate for at least 1 hour (it can wait for a few hours, if you can). Put the prepared vegetables and fruit in a large roasting tray and place the chicken pieces on top. Sprinkle the sea salt all over. Roast in the top of the oven for 20 minutes, then mix everything around a little, making sure the fruit and vegetables get coated in the fat at the bottom of the tray. Return to the oven for a further 10-15 minutes until everything is golden and crisp. While the chicken is cooking, mix the salsa ingredients together in a small bowl. Spoon over the hot chicken pieces before serving. This was the first cake I made for the restaurant. We wanted something that would sit on the bar counter and just make people stare. It has been with us from the first day and I have a feeling it will stay there until the end. We do vary the fruit on top, so we use red plums or yellow plums or raspberries, but really the cherries are the best version. The contrast between the cherries and the green pistachios, and the addition of mahleb to the cake batter, together create something electric. It is such an easy recipe to follow, I am sure it will become a huge favorite in any household. Preheat the oven to 375°F and lightly grease a 9-inch diameter cake pan with butter. Mix all the dry ingredients together in a large bowl. Pour over the melted butter and mix in the eggs. Spoon the batter into the pregreased tin and smooth down. Remove the pits from the cherries—you can do this with a cherry pitter or by just pulling them apart and popping the pits out with your fingers. I like to do this over the cake tin, so that any juice drips onto the cake and adds color. 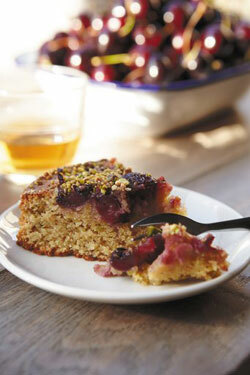 Drop the pitted cherries onto the batter and sprinkle the top of the cake with the remaining 1 1/2 tablespoons of sugar and the roughly chopped pistachios. Bake in the center of the oven for 25–30 minutes, then turn the cake around and bake for a further 8-10 minutes, until the cake between the cherries goes all golden. Allow the cake to cool in the tin, as it needs time to settle, then gently remove by running a knife around the edges. Covered well, it will keep in the fridge for up to a week (not much chance of that happening), but for the best flavor, allow it to return to room temperature before eating.